CITY OF RIVERSIDE: STRONG-ARMING SENIORS FOR A YES VOTE ON MEASURE A? ISN’T THAT ELDER ABUSE? UPDATE:06.03.2013: IT WASN’T ENOUGH THAT BB&K ATTORNEY JACK CLARK ATTEMPTED TO PUSH THROUGH THE NAMING OF CITY HALL IN RECOGNITION OF RON LOVERIDGE.. NOW WE FIND JAMES ERICKSON, VICE CHANCELLOR EMERITUS, UNIVERSITY OF CALIFORNIA RIVERSIDE, ATTEMPTING TO PUSH THROUGH THE NAMING OF MAIN STREET UNDER THE NAME OF RON LOVERIDGE. IN WHAT CAPACITY WE DO NOT KNOW.. LOVERIDGE LANE, RONNY’S STREET OR EVEN RONALD BOULEVARD..
STRONG-ARMING SENIORS FOR A YES VOTE: ISN’T THAT ELDER ABUSE? There is nothing more despicable than taking advantage and misinforming seniors. Where is Ofelia Yeager on this issue, the Chairperson on the Yes on Measure A Campaign? Why was she chosen to spearhead this issue? Why was Mathew Webb of Webb Engineering, the Co-Chairperson christen to participate in this elusive endeavor? Why would Webb Engineering have a master engineering contract with Municipal Water? How does this affect Mathew Webb’s relationship with Councilman Chris Mac Arthur, are they cousins or just doing the Hanky Panky? Or Mathew Webb’s association with now Mayor William “Rusty” Bailey, stating he has known him for decades. Is this all about keeping it in the family? Does it dispute the fact that Webb Engineering recieved 13 Checks on the same day under former City Manager Brad Hudson’s discretionary account? Where is the Council on this one, the Mayor and especially Steve Adams who has asspirations aspirations of being a Congressman? This is only a reflection of how our City operates. Every month the amount transferred goes up, it was $6.1 million now it is $6.7 million, probably because they are not allowed to transfer just yet. But, what now appears to be covered by this transfer is everything that property taxes are suppose to cover. In City Manager Scott Barber’s analysis of possible cuts if Measure A doesn’t pass could very well be considered a scheme, artiface or fabrication since it was simply based on projections. Was this orchestrated and designed to attempt to mislead the voters? The projections have no basis because they never had any accounting track record of expenditures to refer to, they don’t exist. If no prior allocation records exist how does one extrapolate a true analytical projection? According to the City’s October General Fund Forecast, the Mayor Bailey’s Office is overbudgeted by $116,100.00. Instead of cutting his budget, he would rather cut Police and Fire? Further, as indicate City Manager Scott Barber used the number of the adopted budget for the Mayor’s office to apply his 3.0% cut, which comes out to $22,000.00, therefore this amount would be cost applied to the 11.5% transfer. The funny thing is that the number cannot be legitimatel verified because no accounting records of that number exist! Every account that Barber utilizes applies the 3.0% in the same manner. This is an example of how they are misinforming the public. The question to be asking the City, and many are asking the question by the way, “why do they appear to be strong arming the community into a Yes vote on Measure A?” From candidates, community groups, community services, city employees etc. Is it that the City is threatening funding to these programs if a Yes vote is not supported? Money always seems to talk, especially when it is not your own money to spend. 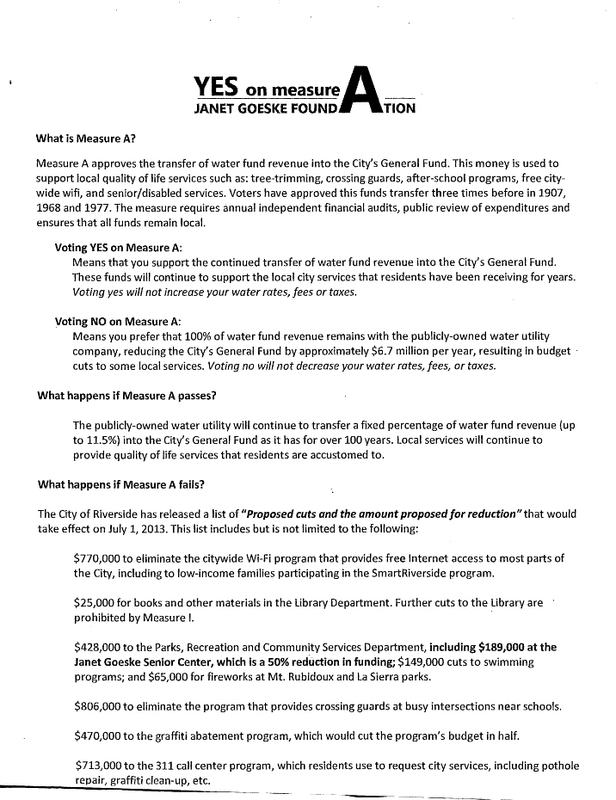 This is a flyer that was dispersed at the Janet Goeske Center which states what will happen to senior funding if they do not vote Yes on Measure A. Is the City of Riverside strong arming residents with an iron fist of reason? Or is it extorsion? Afterall isn’t the Hyatt suing the City of Riverside on this issue? Yes they are. Demand answers! Demand Transperancy! Demand Leadership! Well…at least the first two, and the only way to do this is to show up at City Council and voice your opinions. In the last two utility bills you received; you as a taxpayer have paid for the few rogue City Officials who felt it was necessary to spend your tax money to misinform you, further, to deny your constitutional right of reaching a balanced voting decision. City Tax money was used to favor a “Yes” vote on Measure A. This flyer states to go to the City of Riverside’s web site for more information. 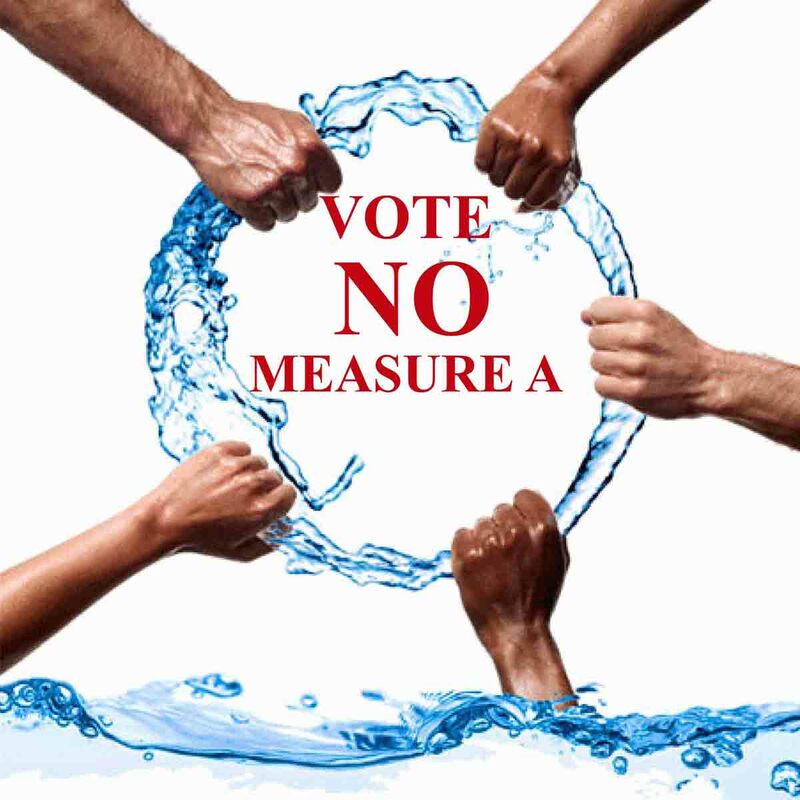 If you go the City of Riverside’s web site, what we have can be construed as a Yes on Measure A bonanza! Another FPPC (Fair Political Practices Commission) violation? CLICK THIS LINK TO VIEW WHAT YOU PAID FOR, EVEN IF YOU DON’T AGREE! 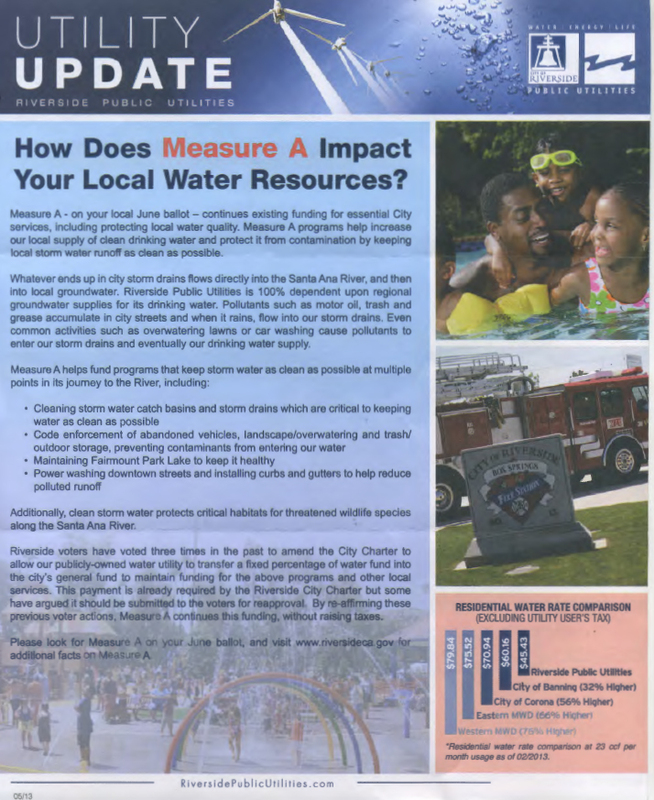 According to Letitia Pepper, Riverside Attorney, the City is using city funds to promote Measure A, and to promote it with lies and propaganda — propaganda is “half-truths.” She says to look at your May Riverside Public Utility bill, on the back ( the above image). There’s a full page promoting the passage of Measure A. This page includes the biggest of all lies: “By re-affirming these previous voter actions, Measure A continues this funding [allegedly and impliedly only for for clean water programs], WITHOUT RAISING TAXES.” The real reason this issue MUST be submitted to the voters is not the self-serving settlement into which the City entered with the Moreno’s that required the City to submit the issue of the excess charges to the voters. The REAL reason the City is doing this is that since 1996, it has been illegal, under Prop. 218, for cities, incuding charter cities like Riverside, to charge more for water than the actual cost of providing it. To make such chares, cities had two years after Prop. 218 passed to submit them for a vote as taxes — and the City never did that until it got caught last year. Is the City contemplating a triple tax by this above action? Is the truth of the matter that the City is in need of paying upcoming bond obligations? Would this be the real issue? WELL LET’S DO A DRUM ROLL TO INCREASE TAXES; SHALL WE COUNCILMAN ADAMS? The mailers that the Yes on Measure A campaign have been distributing have been reflective of their talking points, but this new mailer just received is from the City of Riverside, and it has the City of Riverside star of approval with endorsing names such as our Chief of Police Sergio Diaz, Fire Chief Steve Earley and City Manager Scott Barber. It cannot get any more blatant than this. Legally the City of Riverside has had to take a position of neutrality, while over the past few months the City has stated it was on a Measure A informational tour. This four page City mailer shows that the language can be ultimately construed as a campaign publication endorsing a Yes vote on Measure A. This can be seen by the language and pictorial used, the tone, tenor and timing is there. Further this mailer was paid for by you and me the “Taxpayer.” Therefore is the City of Riverside on the verge of violating FPPC (Fair Political Practices Commission) rules and regulations and misappropriation of taxpayer funds? Elections Code § 8314(d) and Gov’t Code § 8314(d). Gov’t Code § 8314 (a) It is unlawful for any elected state or local officer, including any state or local appointee, employee, or consultant, to use or permit others to use public resources for a campaign activity, or personal or other purposes which are not authorized by law. Gov’t Code § 8314(d) Nothing in this section shall prohibit the use of public resources for providing information to the public about the possible effects of any bond issue or other ballot measure on state activities, operations, or policies, provided that (1) the informational activities are otherwise authorized by the constitution or laws of this state, and (2) the information provided constitutes a fair and impartial presentation of relevant facts to aid the electorate in reaching an informed judgment regarding the bond issue or ballot measure. According to a new article by Dan Berstein of the Press Enterprise, the Council knew of this piece, according to Councilman Mike Gardner, but didn’t discuss the content. So who were the individuals or individual that approved and designed this mailer? Well it appears it was within the City Attorney’s Office. So, who approved the $23,777.00 for the cost of printing and mailing at taxpayer expense? You would think if there was any inkling or sugestion of misappropriation of taxpayer funds that the council would have the descency to ask those obvious tough questions. This I say in lieu of City Attorney Gregory Priamos not returning Berstein’s calls. If it was approved by Priamos, it must be legal, right Greg? Another editorial in the Press Enterprise, “Don’t use taxpayers’ monies for election fliers.” Is the City of Riverside really a “Muni Mafia?” How do they compare to San Bernardino? Or Moreno Valley? The City continues to claim that these transfer monies are used for everything under the sun, and every week we have something new that it covers. The reality is the City has no bonafide track record of accounting of any of these fund at anytime, this we see as Bernstein undercovered in reference to “library books.” Remember folks, only tax money can be deposited into the General Fund. I guess in the real realm of things why won’t District Attorney Paul Zellerbach act on this? Possibly, because of this rhetorical question: “Is it illegal or just bad business?” Possibly all the above, but we won’t expect this office to react in reference to the oath of office you sworn to uphold….regardless, your track record indicates clearly, your answers and responses to local community inquiries. What kind of message does this send to the community when the City itself doesn’t follow the letter of the law? Our we a Banana Republic or an American City based on constitutional rights? SO WHAT IS A D.A. TO DO? CITY OF RIVERSIDE: LAST DAY ON THE DAIS: GOING OUT GANGAM STYLE FROM THIRTY MILES OF CORRUPTION..
(OVER HERE FOLKS!) PLACE YOUR CURSOR ON THIS LINK AND CLICK TO VIEW FULL VIDEO ON YOUTUBE! WOULD MAYOR LUV LEAVE THE DAIS IN ANY OTHER WAY BUT POSSIBLY GANGAM STYLE? WILL THIS BE HIS LEGACY TO HIS YOUNG UCR STUDENTS? WHAT WILL OUR SISTER CITY GANGAM, KOREA SAY ABOUT THIS? WHAT WOULD PSY SAY ABOUT THIS? WILL PSY AND MAYOR LUV NOW MAKE A VIDEO TOGETHER? Dear friends of 30 Miles of Corruption, I am happy to inform all of you that my son Pfc. Brian Pacelli came back from Afghanistan on November 26, 2012 at 10:00 pm. The welcome he received from the American soldiers he helped in the field was overwhelming. There were a lit of hugs and a lot of “I love you Brian” from these kids. My son refuses to talk about what he did for them and I understand him. Because by doing it he feels like he’s taking the spotlight from those who really deserve it. The ones that gave life and limb for our precious country. Please remember them and their families in your prayers. The need them as much as when they were in the line of fire. Thank you all for your support. Maria Lamping Brian’s Mom. Thanks Maria for your heart felt message..
What’s the matter with you people, what’s the matter with you, and he (Mayor), he makes the word that you can’t be like Terry Frizzel and veto stuff. He (Mayor) didn’t like the manner of my operation. But I can tell you one thing. (gasp from mayor). This has to be another side of the mayor people have not yet seen, only if you had worked with him…Will the real mayor please stand up? Hope there are no unforseen skeletons in Rusty’s toolshed, maybe just a red dress? Again, regarding the above photo, one of TMC’s crack minimum wage photoshop experts recreated what former Mayor Terry Frizzel probably saw that shocking day at UCR when then Councilman and younger future Mayor passed on by with young students in the cruze mobile.